These designed dog off-leash areas across the region are beneficial for the health and wellbeing of dogs, but along with the benefits come responsibilities to our pets and the community. It is important to remember these are the only areas where a dog can roam free under an owners control. It is illegal to have dogs off-leash in any other areas. Off leash areas are not for the exclusive use of dogs and their owners. They are for the enjoyment of all, so please be considerate of people who may be sharing the area with you and your dog or using the area after you leave. 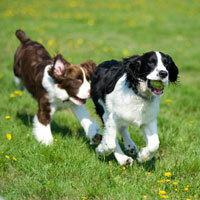 Your dog must be under your effective control for the entire time it is off leash. Effective control means your dog responds to your command and remains close to you. All dogs must be registered with council. Declared dangerous, menacing or prohibited breeds are not permitted in council off leash areas. Some of the off leash areas provide dispensers with dog litter bags. However, you should not rely on their availability. Please make sure you always have equipment with you to pick up and dispose of your dog's droppings. On the spot fines apply if you fail to remove your dog's droppings in a public place. The dog off leash area is the signed part of the park, reserve, foreshore or beach where dogs may be exercised off leash but under effective control.